Budapest is the capital of thermal springs in Europe. There are more than a thousand natural hot springs in Hungary and in the capital of Budapest alone, there are over a hundred! The culture of the baths of Budapest is a testimony to Hungarian history. The Turks who later occupied Hungary for 150 years built some of the world’s finest thermal baths. 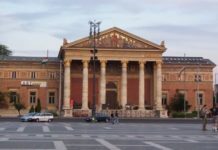 Thus there are more than twenty establishments, baths and thermal baths in Budapest. These baths are part of the tradition and culture of Hungarian life not only for their medicinal (rheumatism, osteoarthritis, muscle pain) and relaxing virtues, but also because they are a meeting place for friends, family and business, from 6 am in the morning in summer and winter. Let yourself be tempted by a visit to the thermal baths, a unique and iconic Budapest experience! Essential full enjoyment of the baths and their exploration, do not forget to bring your ‘flip-flops shoes’ -very useful on the slippery floors of the baths of Budapest. Bring your bath towel because many do not rent them. In the swimming pools, wearing bathing caps is often compulsory in Hungary. Bring your own because the cap rental is not available in all baths. 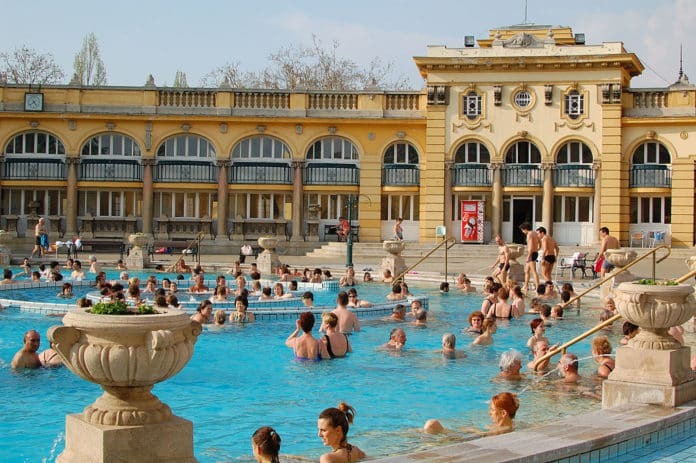 For men, there are no restrictions on swimwear: swim shorts, boxer shorts, bathing trunks are all allowed in Budapest baths. The Széchenyi Baths are the largest baths in Budapest, located in Pest in the “City Park” (“Városliget”). This is our favorite with its architecture, huge Neo-Baroque yellow courtyard and 21 baths, all mixed. The Széchenyi baths, marked by the Neo-Renaissance style, were opened in 1913. Here you will find 3 outdoor baths whose temperature varies between 27 and 38 °C, and 18 indoor baths whose temperature varies between 18 and 38 °C. There are also steam rooms (humid heat, via steam up to 50 °C) and saunas (dry heat up to 90 °C with a humidity level not exceeding 30%). The Széchenyi baths in Budapest can be reached by public transport via the Metro M1 – Széchenyi fürdő station – and Széchenyi fürdő station trolley 72. Address: Állatkerti krt. 9-11, XIVth arrondissement, Pest – map. 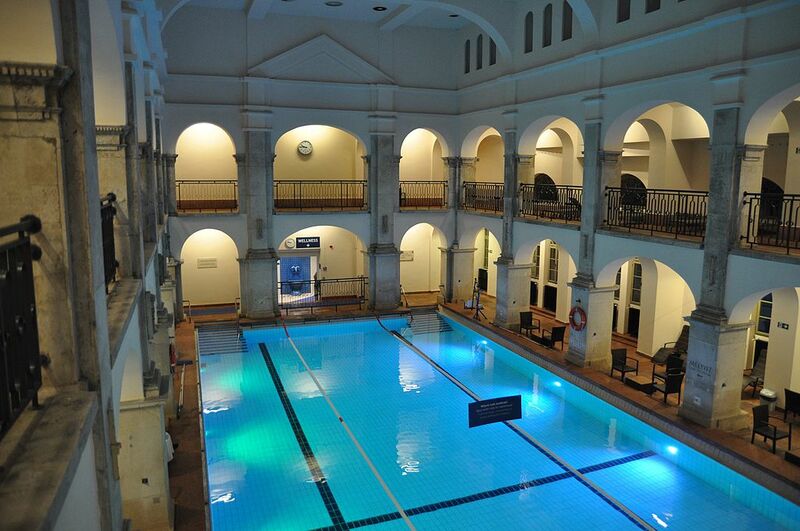 Open hours: from 06:00 to 22:00 every day (indoor thermal baths open from 06:00 to 19:00). The baths are open all year. Christmas hours: December 24th from 6:00 to 14:00, December 25th: 10:00 to 18:00, December 31th: 6:00 to 18:00, January 1st, 2018: 10:00 to 22:00. 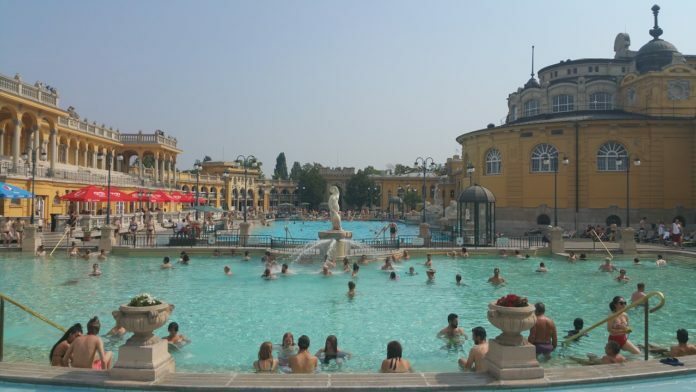 Enjoy a moment of pure relaxation during your time at the Széchenyi baths. Massages of 45 minutes and 60 minutes are available, for one person or a couple – ideal to relieve muscular tension! Information and tickets on the site Spartybooking. The Gellért Baths located in Buda are adjacent to the Grand Hotel Gellért at the foot of Mount Gellért with its hot mineral springs. Opened in 1918, the baths were expanded in 1927 and 1934 with an outdoor wave pool (!) and hot tub. These thermal baths are an institution in Budapest as much by their Art Nouveau architecture as by the many thermal pools and services offered. You will discover the famous entrance with its glass roof and Art Nouveau style gallery and pools made by the famous Hungarian porcelain and ceramics company Zsolnay. Outside you will find a large wave pool (every 30 minutes) at 26 ° C and smaller pools. Inside are a mixed swimming pool and a dozen hot pools, as well as saunas and steam rooms. Massage services are also available. Why are the Gellért baths only second in our ranking of the best baths in Budapest? They have the most beautiful interior decoration of the baths of Budapest (Art Deco decor, mosaics, marble statues and stained glass of amazing beauty) but the non-mixed nature of some indoor pools and the smaller external surface (of baths and rest areas) give a slight advantage in our opinion to the Széchenyi baths. These two baths in Budapest, however, both deserve your visit for an unforgettable experience! 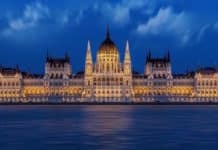 (find them in our article, ’Visit Budapest in 3 days’). The Gellért thermal baths can be reached by public transport via the underground line M4, Szent Gellért Tér station, bus 27 and tram 47 and 49. Address: Kelenhegyi út 4, 11th district, Buda – map. Open hours: from 06:00 to 20:00 every day. Discover on this link a video of the actor Ryan Gosling (Driver, La La Land, First Man) at the Gellért baths in 2017. 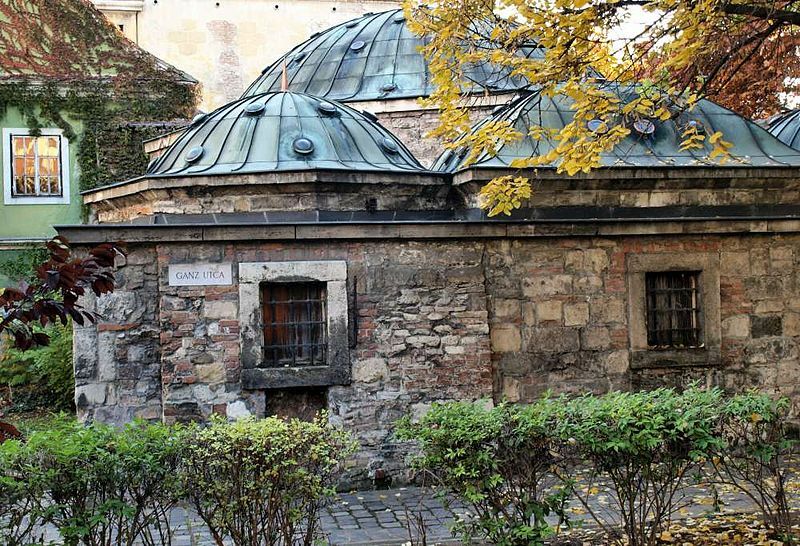 The Lukács baths are among the oldest in Budapest: as early as the twelfth century, the Knights of St John were cured here at the time of the Crusades. Then under the Ottoman occupation, transformed into Turkish baths, they were the favorite of the Pasha Mustapha. The baths were renovated and reopened in 1884 and a second time in 1999. 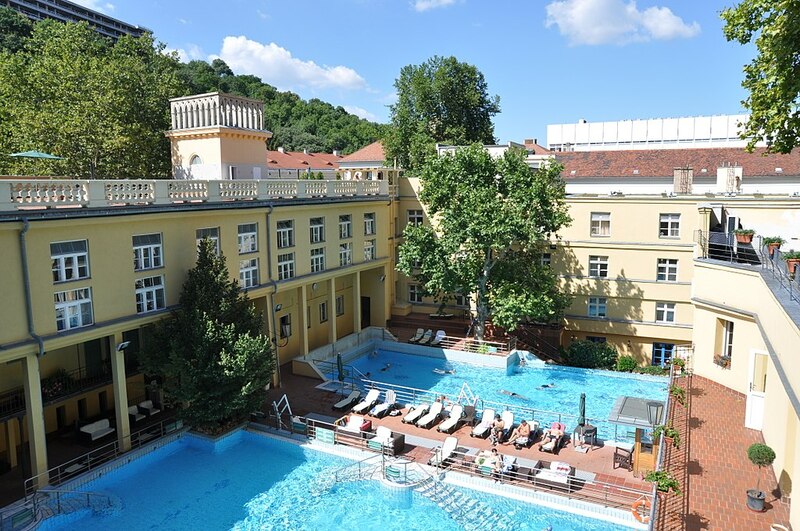 The Lukács thermal baths offer 3 outdoor pools and several indoor pools, all mixed, as well as a sauna, steam room, rooftop terrace and various massage services. These baths of Budapest are a meeting place for Hungarian intellectuals and artists in a less flamboyant atmosphere than other baths in Budapest, but they are also quieter and less frequented by tourists. The Lukács thermal baths are easily accessible by public transport by bus 9, 26, 86, 160 and 260, trams 4 and 6 and are 5 minutes walk from the start of the Márgit bridge, Buda side. Address: Frankel Leó út 25-29, XIth District, Buda – map. Open hours: from 06:00 to 22:00 every day (Monday sauna spa area from 14:00). The baths are open all the year. The Rudas Baths were built in the 16th century during the Turkish occupation. Today they have kept many features of the Turkish baths like the superb octagonal pool, its imposing columns and Turkish dome. The baths offer an indoor pool, various thermal pools with temperatures between 10 and 42 °C, a sauna and steam room. In addition, a new mixed area called Wellness-World of Saunas was renovated in 2017. Very modern (too? ), this space offers a hot bath (36 ° C) on the roof of the establishment with a unique view on the city: an unforgettable experience! Note: the indoor pool and wellness area are all mixed but the thermal baths are mixed only on weekends (see details at the end of the article). The baths are open at night on Fridays and Saturdays from 22:00 to 04:00 (subject to change). 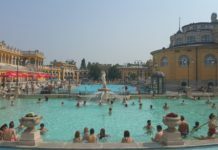 The Rudas Baths, located in Buda on the banks of the Danube, can be reached by public transport by bus lines 5, 7, 8 and 86 as well as trams 18 and 19. Address: Döbrentei tér 9, 1st district, Buda – plan – website. Open hours: Pool: 06:00 – 22:00. Wellness-world of saunas: 08:00 – 22.00. Thermal baths: from 6h to 20h every day but reserved for women: Tuesday, reserved for men: Monday and Wednesday to Friday, mixed: Saturday-Sunday. 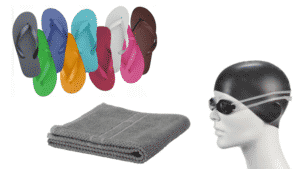 Night swimming (mixed): from Friday to Saturday from 22h00 to 4h00 (except the world of saunas). Christmas hours: December 24th from 6:00 to 14:00, December 25th: 10:00 to 18:00, 31th December: 06:00 to 18:00, 1st January 2018: 10:00 to 22:00. The Király thermal baths are located in Buda and are characteristic of Turkish baths. Built in 1565 during the reign of the Ottomans, the main pool of the Király Baths (pictured above) features a dome that lets in some rays of the sun to immerse you in a unique atmosphere. These small Turkish baths of Budapest are mixed and can accommodate around sixty visitors (3 pools and a sauna). Address: Fő u. 84., 2nd district – Map – website. Open hours: from 9h00 to 21h00 every day. Mixed baths. 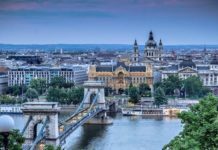 Want to discover other baths in Budapest? Do not hesitate to read our article on this link on our Top 10 Baths in Budapest!